House Speaker Nancy Pelosi (D., Calif.) on Thursday couldn't name any specific accomplishments of former Texas Congressman Beto O'Rourke (D.). 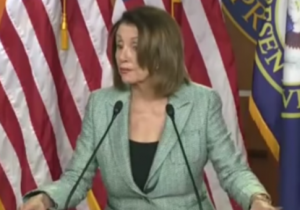 Pelosi was asked during her weekly press briefing to name O'Rourke's "signature accomplishment" during his three-term tenure in the House, prompting Pelosi to stumble with her response. She began by saying O'Rourke "brought vitality" to Congress before getting around to discuss issues he focused on. "When he came, he came as a real champion for the environment. He got a great deal of support from the environmental community in his district," Pelosi said. "He won in a primary on that subject, and also, he was a member of the Armed Services Committee, a strong member of the Armed Services Committee, which is very important for his district. So preserving our planet and protecting our people, there are at least two areas in addition to his vitality," Pelosi continued. The former Texas congressman, who formally announced earlier in the morning he was running for president, delivered a speech at a coffee shop in Keokuk, Iowa. After giving his stump speech, he took about half a dozen question on multiple issues, including teacher pay and climate change. CNN host Poppy Harlow and MSNBC correspondent Garrett Haake noted the lack of detail O'Rourke provided while responding to questions at the coffee shop.